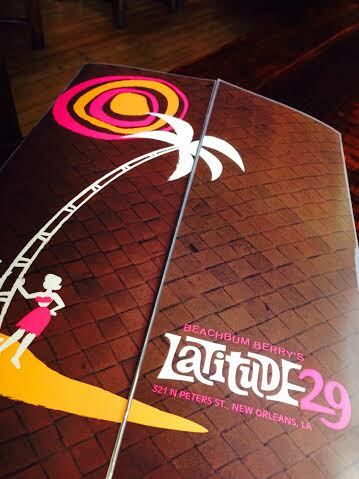 And so finally I got to go the Latitude 29! I´ve been waiting since they opened with great anticipation and (high) expectancy…..well…I try to not have too high expectations whatever it is, better to have an open mind, but with this one i`s a bit different….because this is the BUM`s place….this is the man who uncoded all the secret codes and brought us all these lost drink recipes and who wrote no less than six stellar books on the subject if you count in Taboo Table. His books have been my to go tiki drink (and history) books for years and so now he and his wife Annene Kay aka Mrs Bum opens a real tiki bar in my favorite city New Orleans! And I wasn`t there when they opened….and had to wait all the way until this year´s Tales before I could finally go and see it – and in the meantime I`ve been drooling over all the food and drink pictures (can you say Tahitian Steak Frites?) and the drinks…..oh the drinks…. The Pearl Diver`s glass, the Swizzle cup and the skull barspoons are all new for this summer in collaboration with Jeff Berry and Cocktail Kingdom and they were sold at the Tales but are also available online. The vintage Pearl Diver`s Punch glass is more or less impossible to find anymore so I`m really happy they are re-making them and same for the cool swizzle cup! 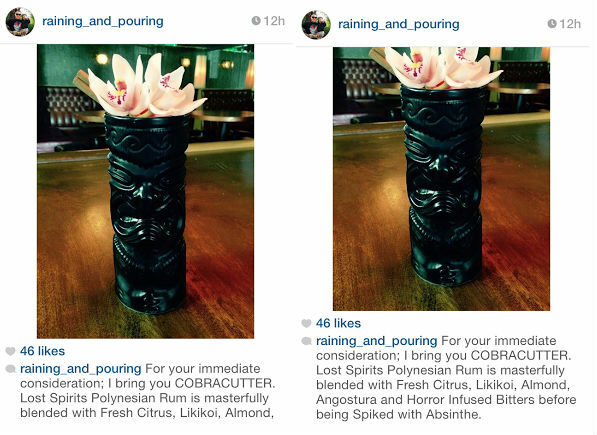 I hope to see more re-making of these type of vintage tiki drink glasses…. And not only are the glasses really cool they come in beautiful vintage looking packages too! The Pontchartrain Pearl Diver was good…..very very good – well balanced and oh so tasty! I didn`t try so very many drinks during the Tales because it was so incredibly busy….and so was I…so I decided to wait until after Tales and THEN go there for some serious drink tasting! So last friday I went there early and I sat there and happily indulged Tahitian Steak Frites with luscious Coconut Butter and later a Mahi Mahi Bahn Mi accompanied by a whole array of drinks until in the evening, I actually spent a whole “working day” in the place! 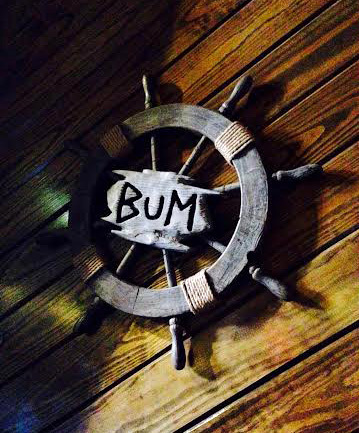 And I had a nice chat with the Bum, about rums and rums and rums…and of course, tiki drinks. I was indeed a very good day….The place is so cool and relaxed, beautifully decorated and the music is great! with everything from real good and cool old style Jamaican reggae to surf music! and the co-bar manager Steven Yamada and his staff are very attentive, friendly and nice. 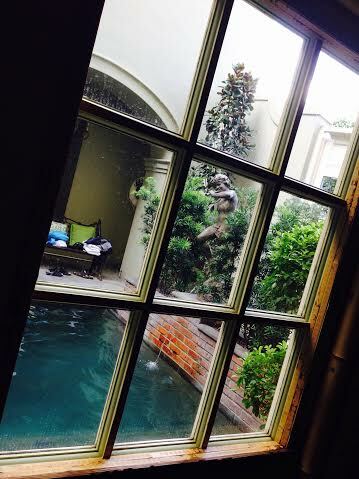 It`s really a place to go not only for the great drinks and food but also to escape from the world outside and it doesn`t matter if there´s big windows to the outside world…..because this is New Orleans! 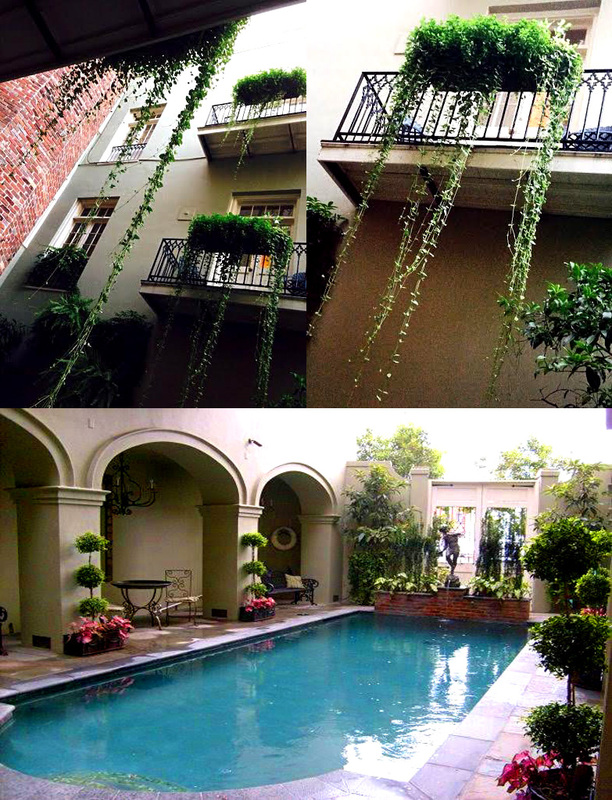 and the view from the beautiful arched windows is nothing but beautiful….over the pool and the tropical plants in the courtyard of Bienville House Hotel. This used to be housing the former Iris restaurant, I went there in 2009 with all the Tales bloggers and now I cannot recognize the restaurant and bar anymore, it´s a total different world! 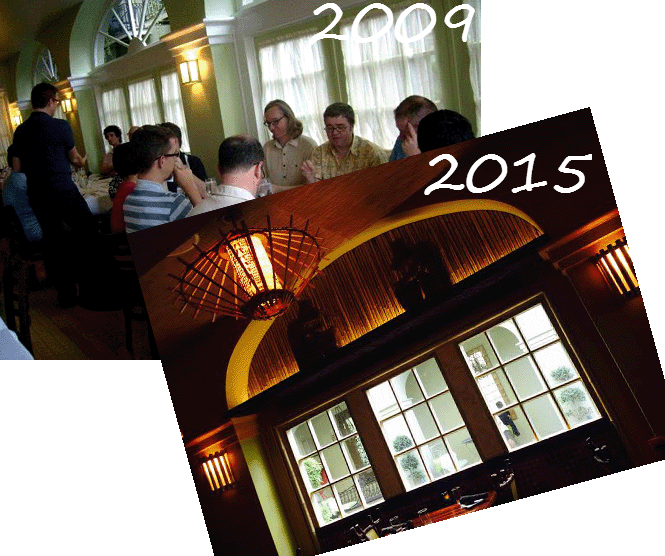 quite the transformation….the only things that looks the same is the courtyard and the hotel lobby. Back in 2009…Alan Walther tends the bar at Iris…..and he did serve some amazing cocktails! he later moved on to Loa, this was long before the Iris became what it is today – a true tiki haven! The Tales Blogger Dinner in 2009 in the former Iris restaurant, the same view today of the beautiful courtyard and pool but the dining room has dramatically changed….. This is such a tranquil and peaceful place….if staying at this hotel you get both all this plus the Latitude29 in one place…..
Hurricane, Kea Colada and Royal Hawaiian Cocktail. The food menu has something for everyone! executive Chef Chris Shortall and his staff creates their own take on modern Tiki Cuisine which is playful and tasty and there`s something for everyone including options for vegetarian, vegan and gluten-free guests. First thing I opted for was the Tahitian Steak Frites which I`ve been dreaming about since they opened….. The Tahitian Steak Frites are tender, luscious and juicy (I ordered mine medium-rare) served with hot crispy thin fries and a tasty dipping sauce plus a dollop of coconut butter on top! the Bum told me that in Tahiti they add coconut to the cow´s diet and therefore everything the cows are producing have a touch of coconut flavor…heavenly….and so they wanted to re-create that idea here with the coconut butter. I`m not joking, I think I could eat this almost every day….the meat is so tender and melts in your mouth together with that lovely coconut butter…. The Mahi Mahi Bahn Mi is wild caught Mahi poached in coconut oil, jalapeño, sriracha, and shallot….and at a Chef`s Challenge before the Tales I tried the ribs which are very tasty too….and not to forget the crispy green beans! Another nice dish is the Shrimps in Blanket, the gulf shrimps here really are something special. They are big and juicy….and have more shrimp flavor than shrimps I`ve tasted anywhere else. 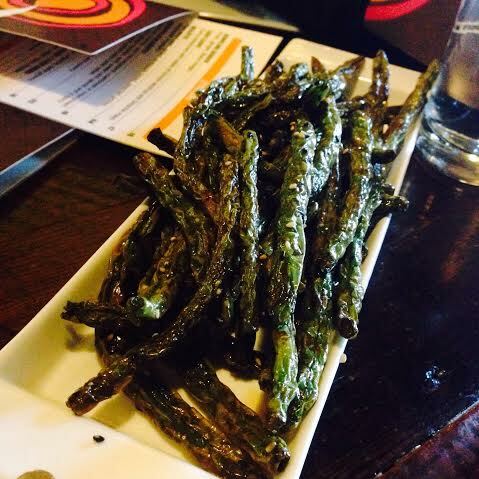 These green beans were amazing…..
An array of seductive tropical tiki drinks….. 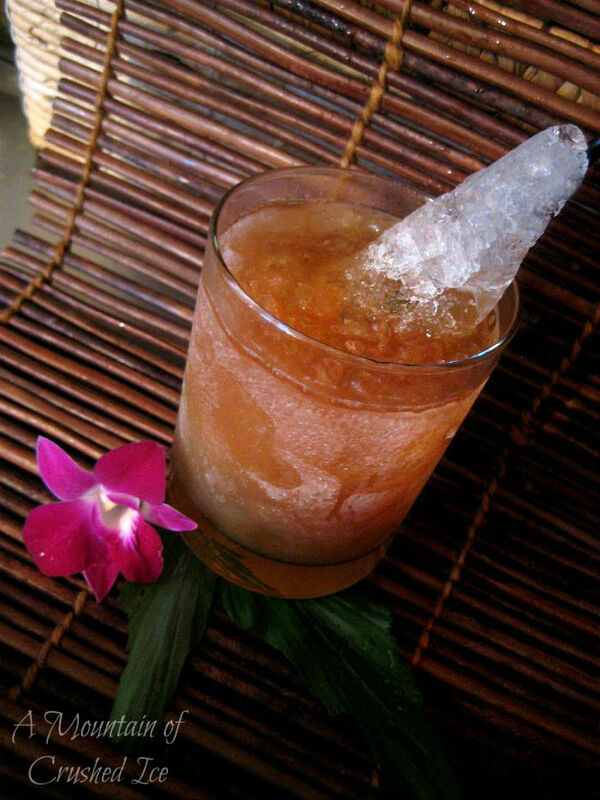 So I started with the Pontchartrain Pearl Diver….it`s such a good drink!…..balanced, fruity and rummy! 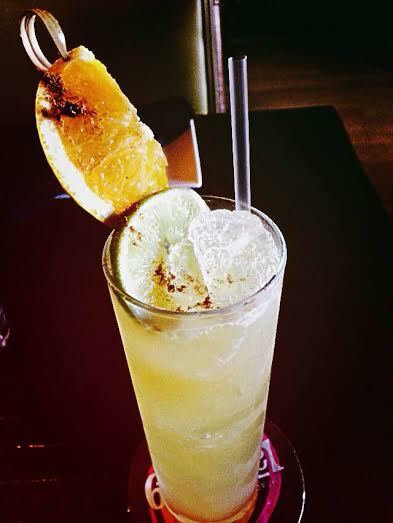 The Pearl Diver is a mix of honey-butter-spice mix blended with passion fruit, lime and Jamaica rum. The butter adds a wonderful slightly viscous mouth-feel, if you didn`t know it was butter in the mix you wouldn`t know what it was but you would know there was something there…. 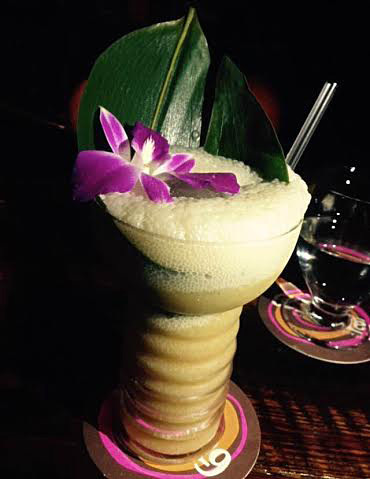 After the Pearl Diver I had the namesake drink of this bar – the Latitude 29…..it comes in a tall glass wrapped in banana leaf for that real tropical feel – and you get that cool gorgeous swizzle stick! – made after the wall art by Bosko! The drink is made with eight-year Demerara rum, passion fruit purée, house made Madagascar vanilla syrup, orange, pineapple and lemon. They are both gorgeous in their presentations with the Pontchartrain Pearl Diver in the new re-made super cool Pearl Diver`s glass. 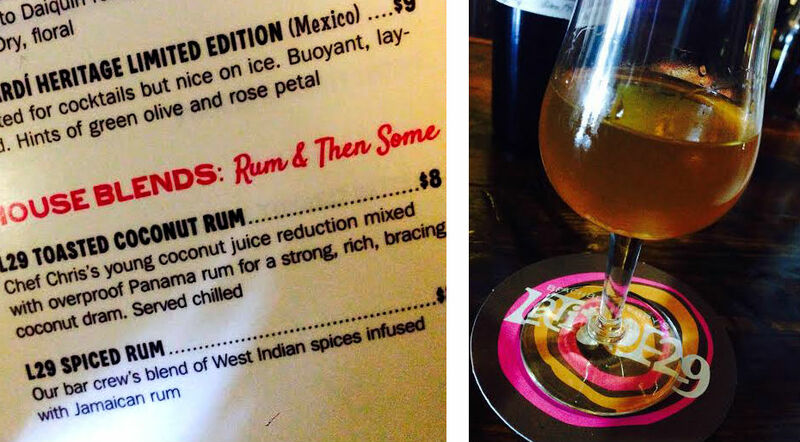 The Rum Barrel is according to the menu a communal drink but it says “For 2 to share, or 1 thirsty pirate to hoard. A kill-devil’s brew of 3 rums, 4 juices, multiple herbs, spices and sweeteners …” – so apparently I`m a “thirsty pirate” since I had no problem drinking it all by myself…. It`s presentation is BEAUTIFUL! and fun! 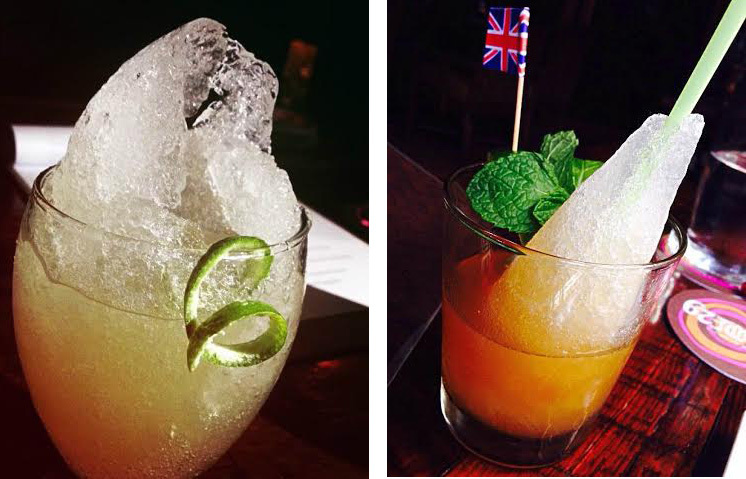 see the picture….they really take time to garnish up these beauties….and the drink itself is strong and rummy/fruity/spicy. One of my favorites! 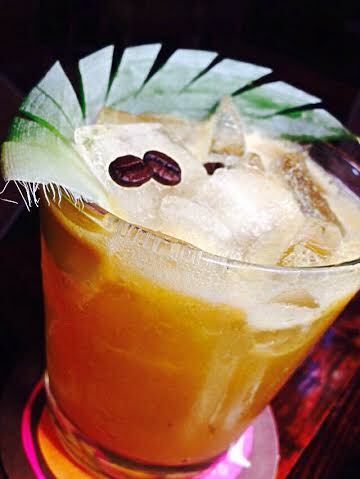 And so is the Coffee Bongo…..also incredibly nicely garnished….with a pineapple leaf cut out to look like a palm tree frond…..topped with two coffee beans….stunning! the drink is also strong/spicy and rummy with lots of character and if you like coffee and pineapple together, you find it here. Every drink is not rum though….there´s a drink called “Outcast of the Islands” which was amazingly tasty and is a mix of London gin and Persian lime…with cinnamon, ginger, almond and anise, heavenly…. And there are drinks with bourbon, brandy, tequila, beer and vodka….but I haven`t tried them all yet….there`s something for everyone in the drink menu too. 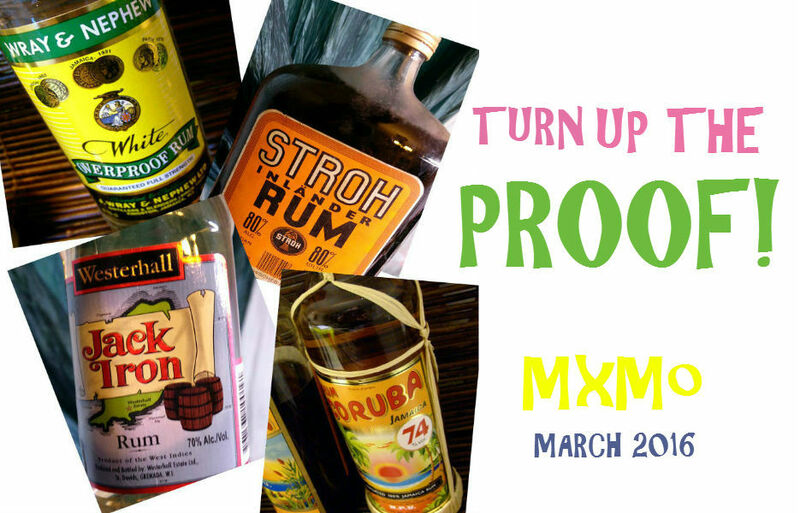 Me, I tend to mostly stick to the rums…. 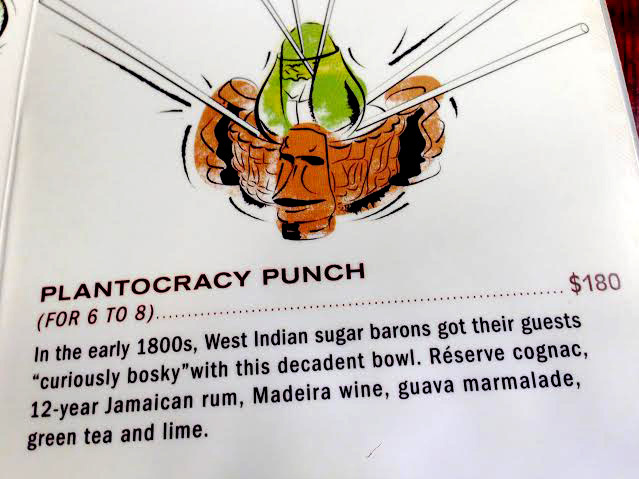 The Professor Remsberg`s Punch is a very interesting drink and very tasty too, the drink contains “Fine old Guadeloupe rum, gently stirred with lime and a Caribbean spiced syrup discovered over 30 years ago in San Juan by the Professor himself”…….I wonder what is in that syrup? If you didn`t know, Stephen Remsberg is the world´s biggest rum collector. All the drinks at Latitude 29 are good and well balanced, from the (real, no chemical-mix) Hurricane, Mai Tai, TOTC Swizzle, Nui Nui, Kea Colada, Royal Hawaiian Cocktail, Lapu Lapu, Hawaii 504, Missionary`s Downfall and the Paniolo….which is Kentucky bourbon and Hawaiian macadamia nut liqueur shaken with lime, house made cranberry syrup and a dash of molé bitters. It`s evident to me that they pay as much attention to the garnishes as the drinks themselves because some of these drinks ar off the charts when it comes to beautiful presentations! you get a little work of art in your hand! 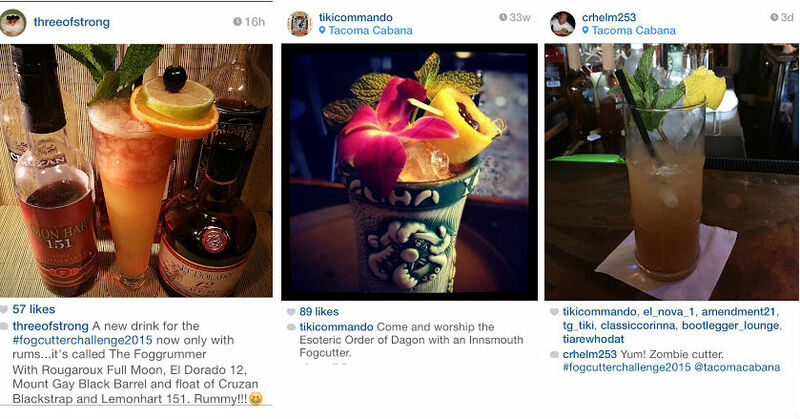 And the drink names alone takes you on a exotic journey…..a lot of them created back in the heydays of tiki. You know, you need to go there and just try all these heavenly things! 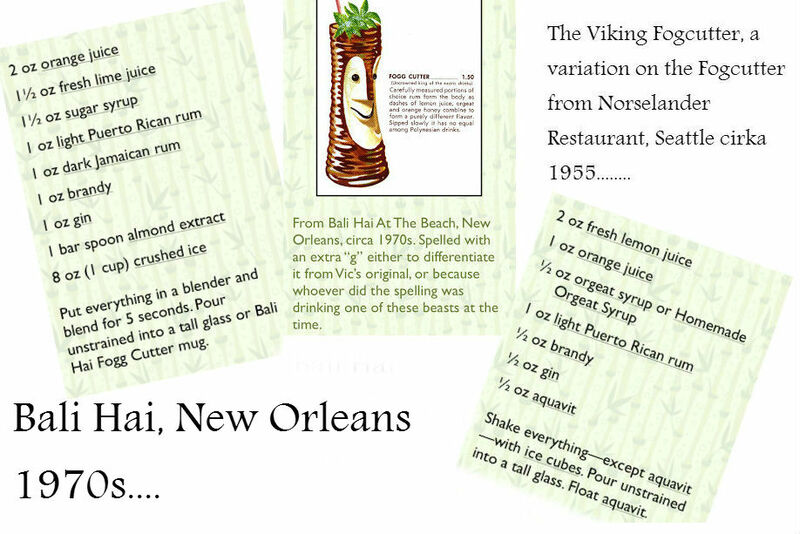 btw….between 3 and 6 pm every day it´s Happy Hour with a special menu….where among the drinks you`ll find the Banana Banshee and the Royal Hawaiian Cocktail….both perfect to cool you down when it´s hot outside which is a guaranteed thing in New Orleans during the summer. 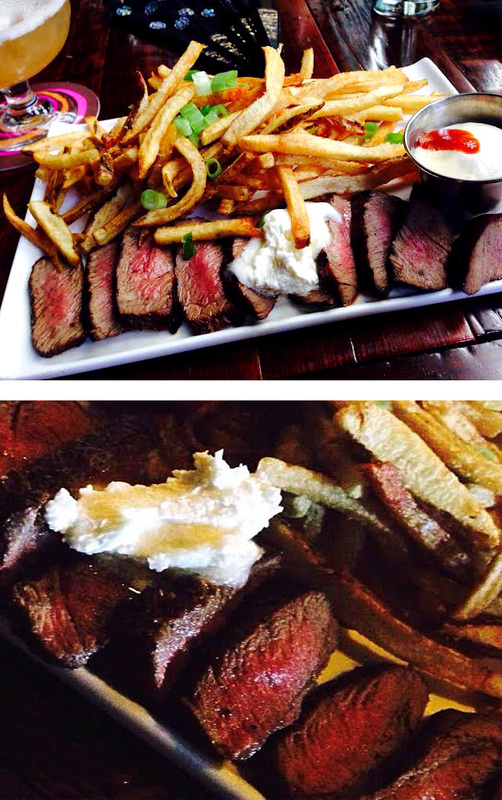 And the best thing of all….you get the Steak Frites for half the price! what is there not to love? 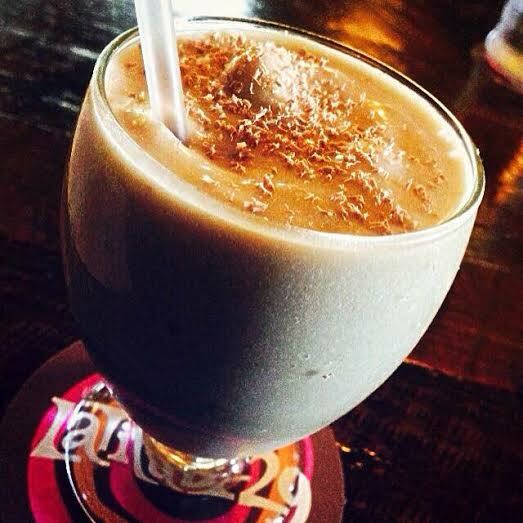 The Banana Banshee is a frozen cocktail with Jamaican rum, lime, coconut milk and coconut cream, fresh banana and aztec bitters and topped with grated chocolate! 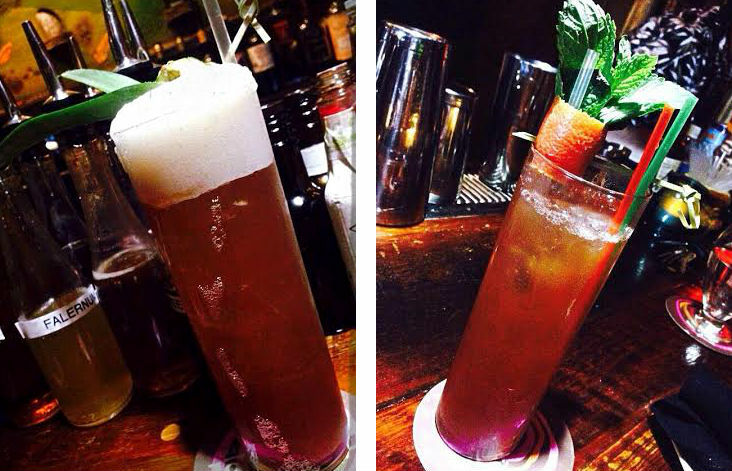 The Zombie was spicy and nice just as I expected, and just about right with the strength, and the Kamehameha Rum Punch did live up to it´s name…..
Kamehameha Rum Punch and the Zombie….. 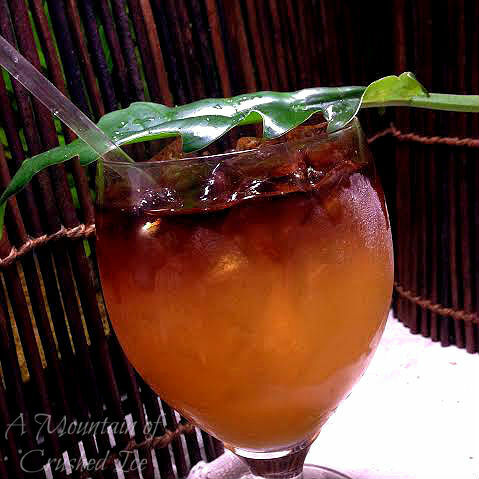 This interesting drink recipe is from Sippin`Safari and originates from the Hotel King Kamehameha in Kona, Hawaii, as the origin of the drink around 1960. So who was King Kamehameha you might ask? Kamehameha – also known as Kamehameha the Great was the head of a dynasty ruling the Hawaiian islands for more than a century. The name Kamehameha (pronounced kuh-may-ha-may-ha) means “the one set apart.” He conquered the Hawaiian islands and formally established the Kingdom of Hawai`i in 1810. 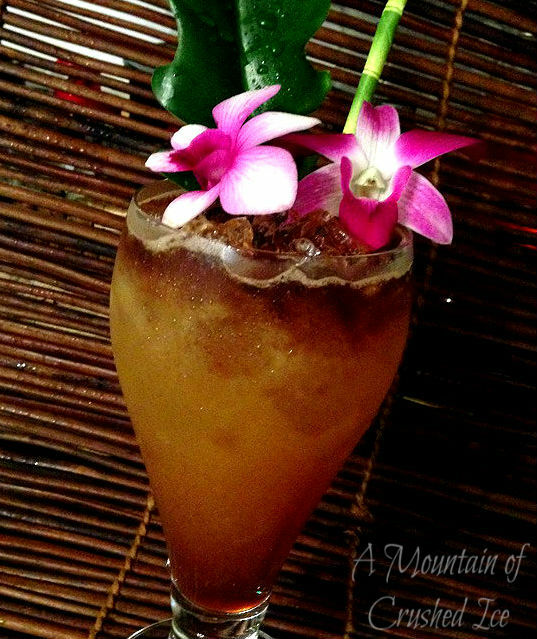 This drink is actually named after the Hotel King Kamehameha in Kona, Hawaii who took the name after the great Hawaiian King – Kamehameha. Every year on Kamehameha Day (June 11, a state holiday in Hawai’i), National Statuary Hall is the scene of a ceremony in honor of the king and the statue of Kamehameha the Great is draped with lovely (and loooong) leis of fragrant flowers from Hawai’i. The Festival continues to pay tribute to Kamehameha and acts to preserve and perpetuate the Hawaiian culture. And as every tiki bar should, there:s also a couple of different communal drinks on the menu, the newest one is a monster drink called the “Plantocracy Punch” for 6-8 people but we were only three so we tried the Lapu Lapu which uses a recipe which according to the menu is a Don The Beachcomber’s “lost” unpublished 1964 recipe, recently discovered by the Bum and presented here for the first time in over 40 years. 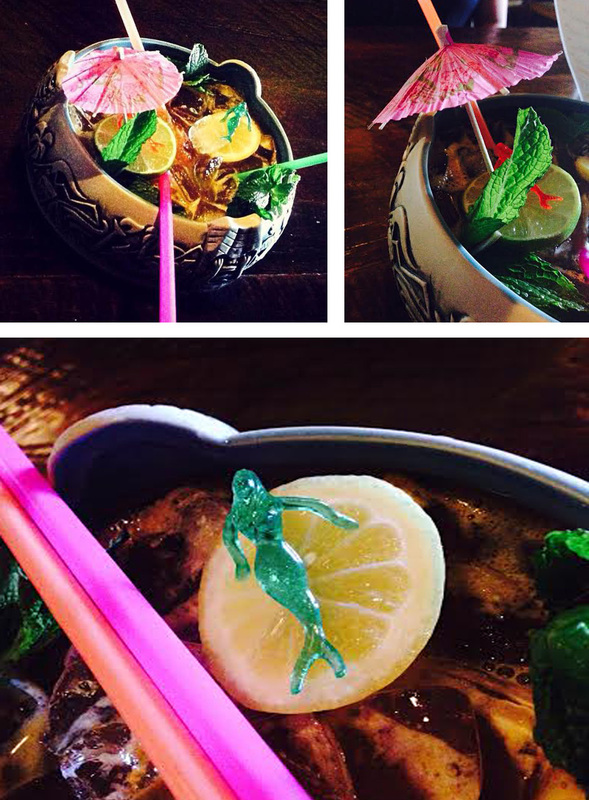 And of course it`s appropriately garnished with little mermaids taking a rummy ice bath…..
Fruity, spicy, rummy Lapu Lapu and little mermaids swimming in the bowl…. While sitting in the bar I spotted two Samaroli rum bottles….and so of course I ordered a sample of each….and with the rum samples you get a small shot glass with water and a dropper, neat. One was the 13 year old Guadeloupe 1998 Rhum Agricole and the other 1988 Demerara Dark Rum. The Guadeloupe is spicy and a touch smokey, with a strong character but at the same time, not too aggressive, it´s fruity, peppery, balanced and picky but also smooth. A few drops of water brings out a whole array of tropical fruits flavors! this rum is incredible. I REALLY liked it! The 23 year old 1988 Demerara rum had flavors of wood, macerated tropical fruits, apricot, vanilla, banana peel, mango and something else I couldn`t define…..but here a few drops of water didn`t bring out much change….still very woody, strong and fruity. Also a very good rum! Both of these rums are distilled in the Caribbean and then matured in Scotland. They are not cheap but they are unique rums and they give you something to remember. Then I saw a curiosity on the menu….it had a sort of mellow toasty coconut flavor…interesting….and I think it also could be used as ingredient in some of the drinks maybe? 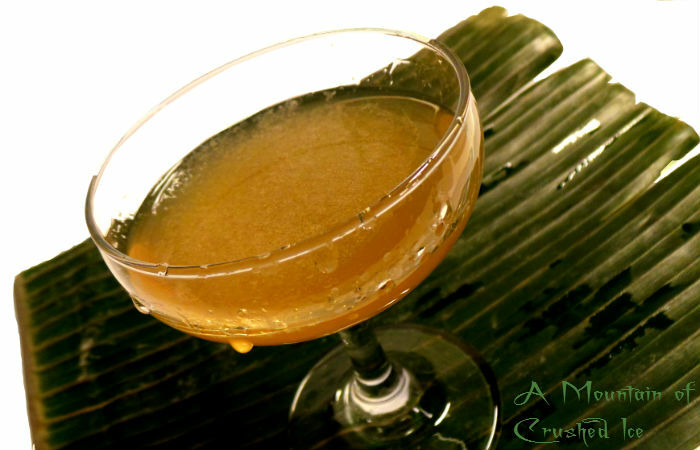 how about a Toasted Coconut Daiquiri? Here is top crafts….the first thing you notice is of course the big centerpiece which now is in the same spot as the huge mirror was when it was the bar at Iris. 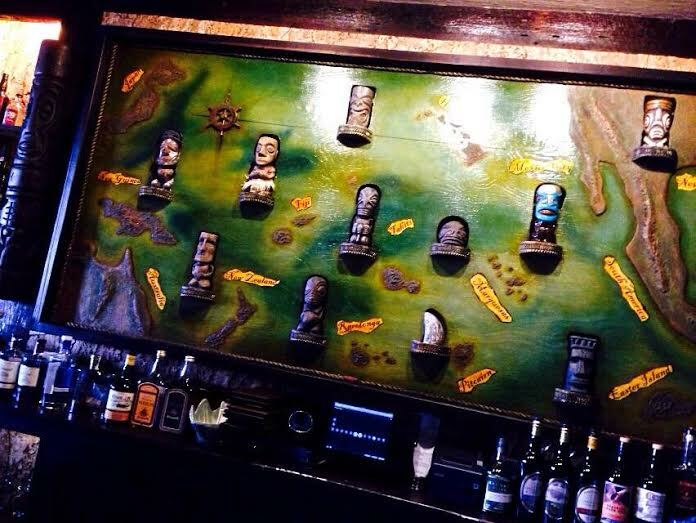 The centerpiece is a huge carving of the Pacific Islands in a map in the forms of small tikis made by Daniel Gallardo aka Tiki Tiablo, and it`s a stunning work of art!! Here is a collage of close-ups of the “Islands” in the map and there´s a nod to New Orleans too….do you see the fleur de lis on top? 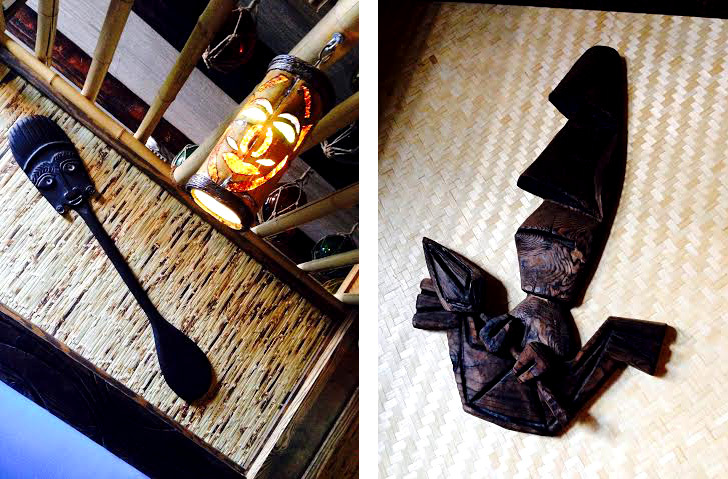 Bosko Hrnjak did all the new (non-vintage) light fixtures and all of the new (non-vintage) tiki carvings, wall panels, etc, over 50 of them in total. And Dave “Basement Kahuna” Wolfe did 8 Easter Island carvings on the hut wall-dividers. Another (practical) thing I greatly appreciate are the power outlets with USB ports located on each side of the tables, I wish more bars had that, it should be standard everywhere. 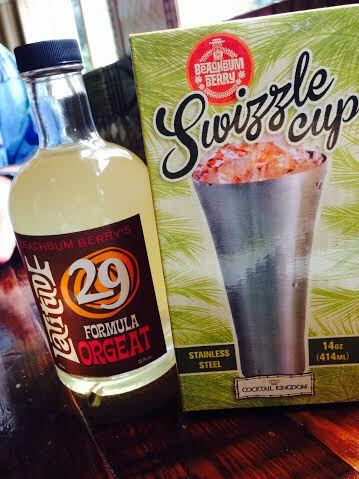 All tikiphiles already knows about the Pearl Diver`s glass, the swizze cup and the cool skull bar spoons which you can find at the Cocktail Kingdom which I mentioned above….but a new thing is the Latitude29 orgeat which comes in a heavy round glass bottle and is sold in the bar. I haven`t tried the orgeat yet even though I bought a couple of bottles (USD 15 each) but i`m out travellling so that will have to wait. So to sum it all up, what I was looking for was how the food and the drinks tasted and were presented and if there´s consistency…. (and yes I have returned) and how the decor and the feel of the place was, what music did they play and how loud? is it possible to have a conversation or do you have to scream? and how I was treated as a guest. Personally I have nothing to complain about, the food and drinks are top class, the decor tasteful and genuinely tiki, it`s a laid back and relaxed feel, the staff attentive, professional and very sweet and so I`ll keep coming back, this is now my primarily watering hole in New Orleans :-). 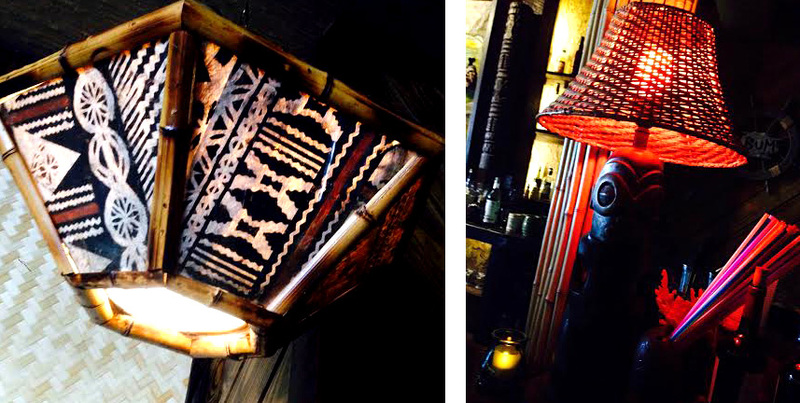 That said there´s a lot of very good bars here, I just happen to really really like well made tiki drinks and in the relaxed vibe and environment of a real good tiki bar, there I feel the most at home. This weekend there has been a Fogcutter challenge on Instagram where you could participate by making Fogcutters and variations of it and it was not a recipe contest even though the drinks should be based on the original recipes with great variations allowed….but one didn´t even necessarily have to make a drink either, it could be a drink from a bar as well, but it was a picture contest! and there is a prize! The whole thing was invented by El Nova last weekend when it was the Navy Grog Challenge, it was created because Jason Alexander (Tacoma Cabana – they actually serve no less than 7 different Mai Tai variations!) 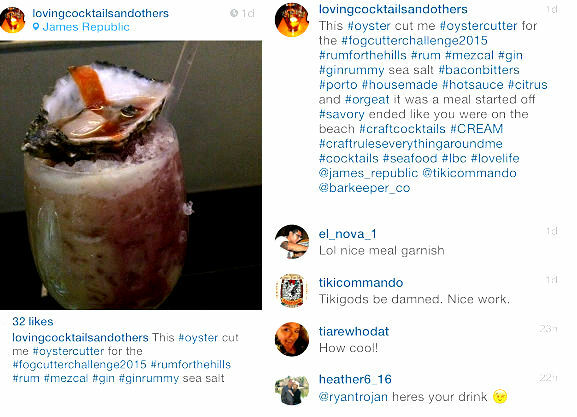 had an awesome Navy Grog recipe and El Nova thought it would be fun to make a Navy Grog challenge and post it up on Instagram to see how people display their drinks. Then he asked Jason and a few other people to help promote it on Instagram. And then I found out from seeing a blog post on the Navy Grog Challenge made by Oriol over at Three of Strong and decided to join in to the fun! My Navy Grog made with Jeff Berry`s Navy Grog Cone Kit which can be purchased at Cocktail Kingdom! Now I came in too late for the Navy Grog even though I even posted up a pic of one of my Navy Grogs, and so then I decided to jump into the Fogcutter Challenge. 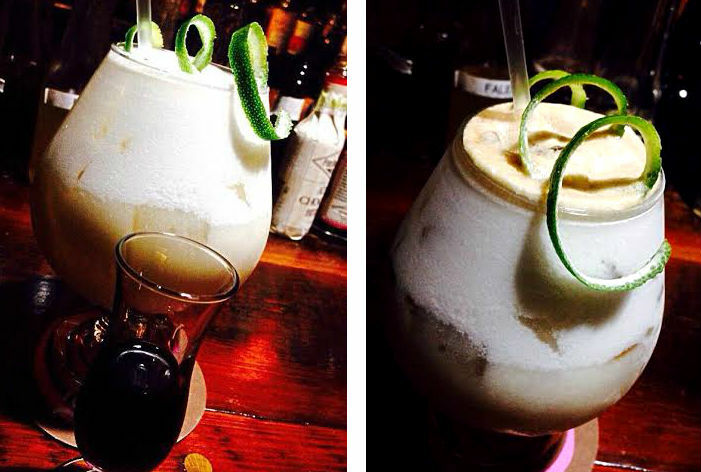 There were a lot different takes on this classic tiki cocktail, with everything from an Oyster Cutter garnished with a real oyster (!) 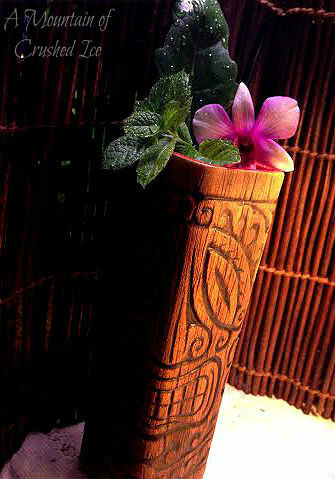 to Jason Alexander`s triple flaming Scullcutter to a fantastic looking Cobra cutter in a black tiki mug made by Rob Hawes (Maui Tiki Tours ) containing Lost Spirits Polynesian rum, Oriol`s (ThreeofStrong) awesome looking Fogrummer to a Frankencutter and the classic New Orleans Bali Hai Foggcutter. There was no shortage of imagination! 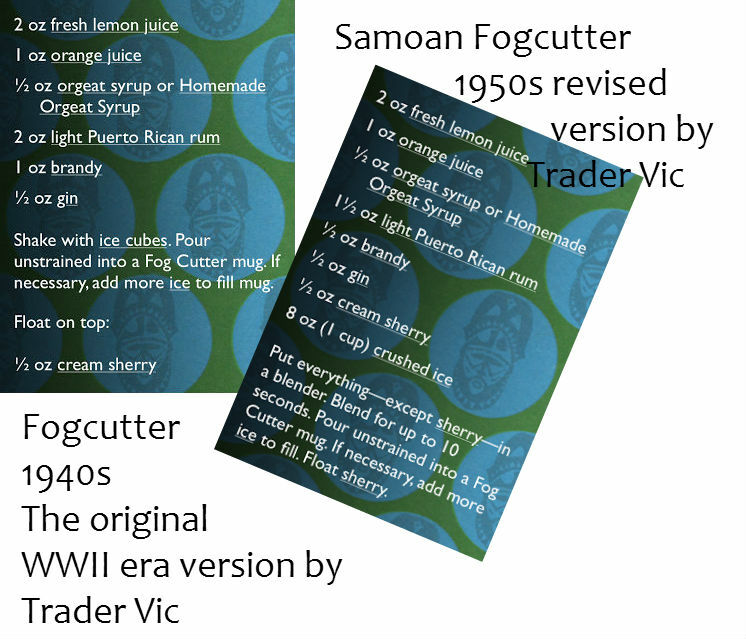 Pics of recipes taken from Jeff Berry`s Total Tiki App, courtesy Jeff Berry! you can purchase the app (Iphone and Ipad) in the Appstore! 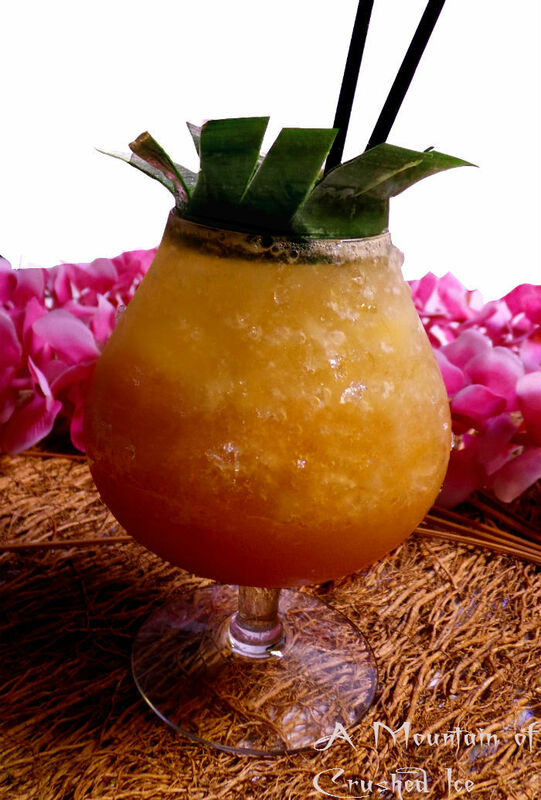 to me, it´s a must-have, I use it all the time, so handy…..The Total Tiki is a unique recipe database of almost 250 great exotic drinks and Tiki cocktails. read more about it on Jeff`s own blog. 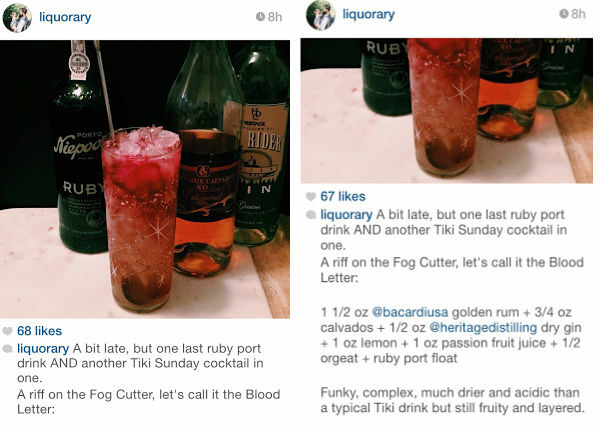 They really got me into a Fogcutter experimenting mode….so I made four different varietes, all in a rummy style because I was in a rum-mood….isn`t it fun how booze nerds can come together online and do something like this? it reminds me of the old Thursday Drink Nights, the so called TDNs which we did back in around 2008-09, the best drink and photo wins a good prize….and along the way we have a lot of fun! I don´t know what the prize is or who will win it because that is not yet revealed but I know one thing, this is all for the fun of it! and along the way you get a lot of inspiration and you get to imbibe a couple of nice tiki drinks too, so what`s there not to love? Here`s a picture parade of a few of my screen shots of some of the drinks and further down are my own versions with recipes. I also post up pictures of the recipes on which all these drinks in the Fogcutter Challenge were based so you can make your own variations, it´s a really tasty drink I think, just one thing, the Fogcutter is pretty tart so if you like it a bit less tart, (I do) use a bit less of lemon or lime and up the orgeat a bit…. Here is a feast for the eyes! 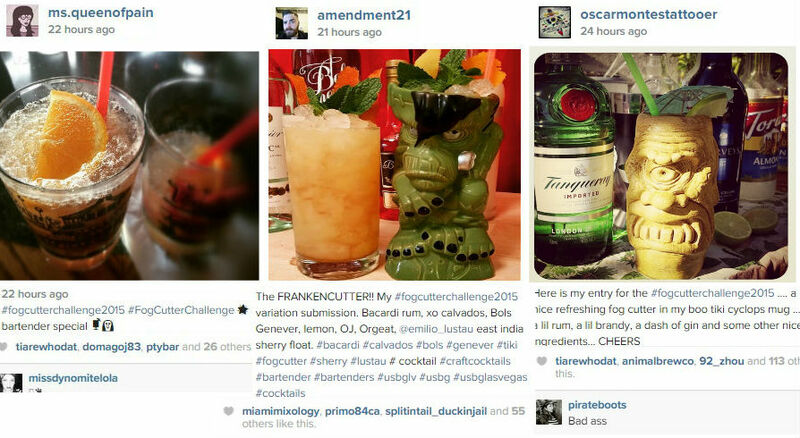 but there were many more than these…..you can find them if you use hashtag #fogcutterchallenge2015 on Instagram! there you will also see which Fogcutter picture will be the winner! Arent they just lovely? these are a fantastic collection of Fogcutter variations! Are y`all thirsty? …. I sure get thirsty by looking at these pics of amazing drinks and then finally also here are the ones i made, they differ from the original recipes in that they all contain only rums, yes I was in a total rum mode 🙂 they are based on the 1940s Fogcutter but the ratios of citrus and orgeat are a bit different. And for some reason I decided to venture away from the traditional tall glass and use another….but I used Rob`s awesome tall woodgrain tiki mug for one of the drinks. 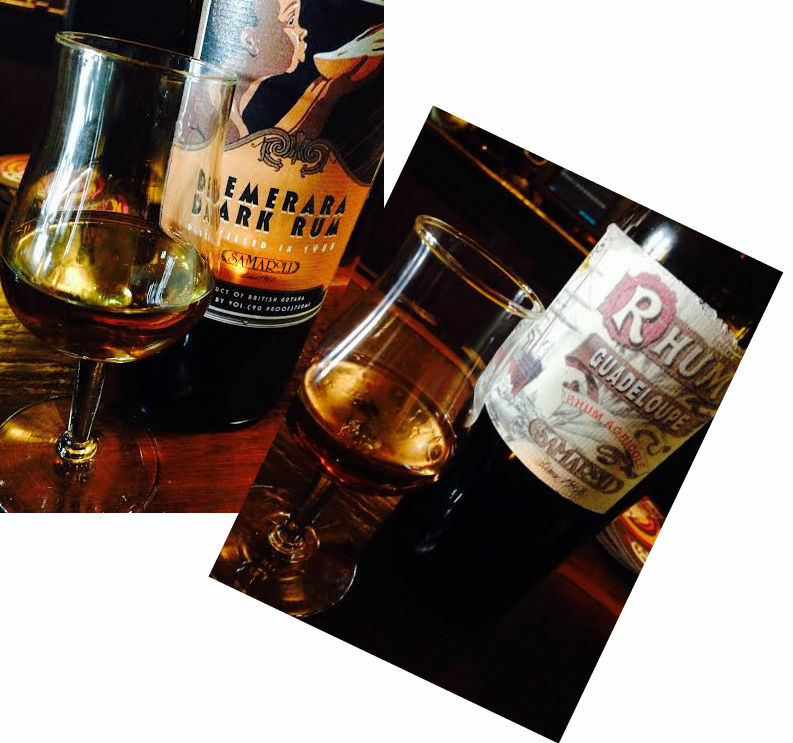 They are also quite similar both in taste and look, in that they are all variations on the same theme…with hm….quite similar rum selections as well, yeah that´s how it turned out! I think was in a blackstrap mode that night…and remember this was a night of experimentation…. 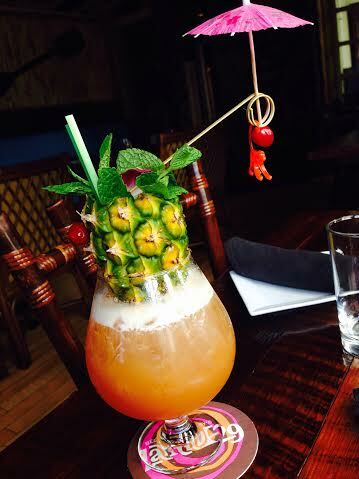 Garnish anything tropical and exotic! 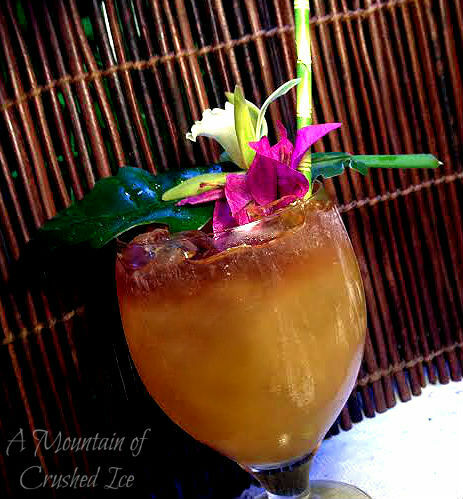 Shake with ice cubes and pour unstrained into a glass (tall or fancy) or tikimug! filled with some more fresh ice cubes. 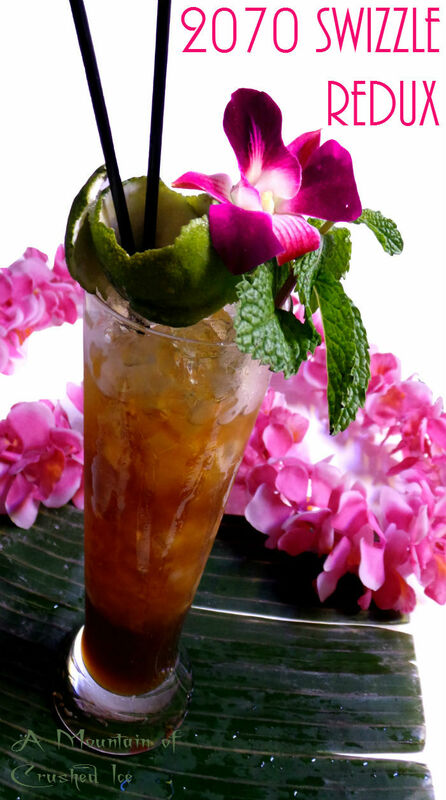 Shake and donate to a tall tiki mug filled with fresh ice cubes, garnish with tropical leaf and orchids. Rum and Tiki is fun!